Scott joined the Shrine staff in 2016. He has been working in a support role, helping with the weekly count, processing credit cards, and building out our new Shrine web site. Scott first encountered Our Lady of Pompeii in 1977, while a student at UIC and in search for a church to attend mass. Forty years later, he returned and now loves the energy and warmth of the Shrine community. He can be reached via email or at 312.421.3757. She can be reached via email or at 312.421.3757 x306. Laura Medina started as a volunteer archivist when Carl recruited her after seeing her attend the Wednesday evening mass in 2001. In 2006, she became the Shrine’s Receptionist/Archivist. If you have any questions about The Shrine, want to register for an event, or you need a mass card, or a membership in our Perpetual Light Society, Laura can help you. As archivist, Laura can provide you with a copy of your baptismal, wedding, or first communion certificate. She can be reached via email or at 312.421.3757. 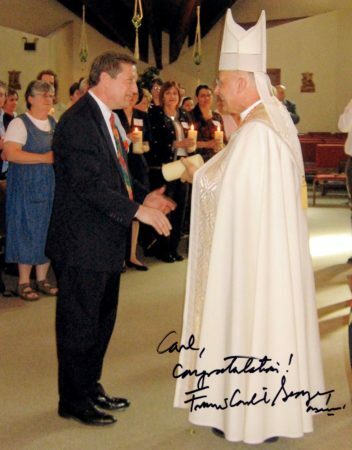 Mr. Wachsmann was Called and Commissioned as a Lay Ecclesial Minister by Francis Cardinal George, O.M.I., on 7 May 2006 at St. Monica Catholic Church, Chicago. “Lay Ecclesial Ministers are experienced pastoral ministers who have been spiritually formed and theologically educated for collaboration with a supervising [shrine rector] parish pastor… (cf. The Archdiocese of Chicago Directory 2015, pg. G2)”. Mr. Wachsmann currently serves as a Pastoral Associate at The Shrine of Our Lady of Pompeii. As of 2015, he is only one of several men whom have been Called and Commissioned as Lay Ecclesial Ministers within The Archdiocese of Chicago. He can be reached via email or at 312.421.3757 x315. 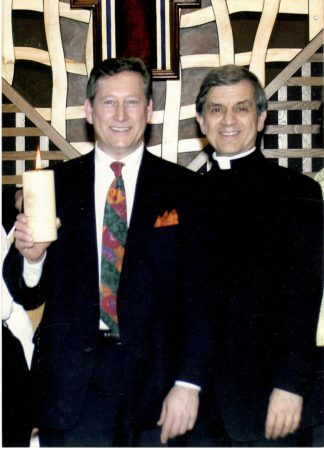 Fr Richard Fragomeni, Ph.D, Rector of The Shrine of Our Lady of Pompeii and J. Carl Wachsmann, Pastoral Associate, May 7, 2006, St Monica Catholic Church. 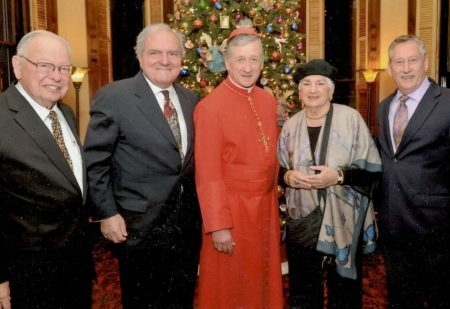 Craig Reckard, Vito Petruzzelli, Carninal Blasé Cupich, Jeanne Petruzzelli, and Carl Wachsmann at Cardinal’s residence 22 November 2016 as part of Illinois Patrons of the Arts in the Vatican Museums, Nativity Art of the Chicago Archdiocese Collection. 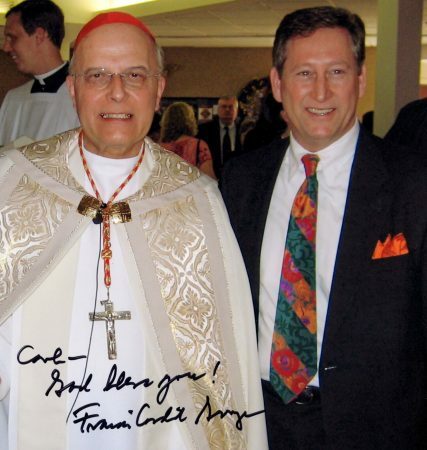 Carl with Cardinal Francis George, O.M.I.